Mumbai: Facing a talent crunch that is familiar to many firms, the elite Indian Institute of Technology (IIT) Bombay is offering all new faculty members a signing bonus of Rs3 lakh. Significantly, the bonuses are being raised by donations from IIT alumni, generally a high-achieving bunch who, in recent years, have become more active, organized and sophisticated in giving back to their alma mater. “This is a first for any of the IITs," says Deepak B. Phatak, professor at IIT’s Kanwal Rekhi School of Information Technology. “We hope that this will influence what we call decision-making on the margins," says Phatak, who is convenor of IIT Bombay’s golden jubilee, or 50th anniversary, celebrations. The two initiatives are part of the celebrations. The move also shows how even India’s most prestigious institutes of higher education are no longer able to overcome their relatively poor compensation packages and attract young talent. A growing dearth of students obtaining doctorates has also added to the pressure. Remuneration for faculty at the IITs range between Rs25,000 and Rs50,000 a month, peaking at Rs6 lakh annually. The run-of-the-mill software professional, with under five years of experience, earns more than that, about Rs6.2 lakh, according to market researcher IDC India. "Unless something is done to attract good faculty, the institute could face a serious faculty crunch as many members are due to retire in the near future," said Ajay Ranade, chairman of the IIT Bombay Alumni Association and a 1982 graduate. To attract new faculty, IIT Bombay’s class of 1982, which celebrates its silver jubilee this year, has pledged to raise about Rs6 crore for the institute. Ranade says all alumni are welcome to donate. 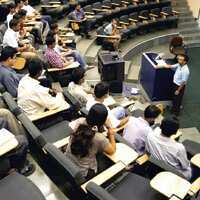 IIT Bombay has a faculty strength of 420 and has about 100 vacant positions. And it is hardly alone—according to one estimate, the seven IITs face a cumulative shortage of at least 900 faculty members. Still, the IITs, which are India’s top-ranked technical education schools, have fared better than other engineering institutes across the country. According to a report on revitalizing technical education in the country, an additional 10,000 doctorate holders will be needed by 2008 alone to meet faculty requirements at Indian engineering institutions. The 2003 report was authored by a ministry of human resources development committee headed by U.R. Rao, a prominent scientist and former director of the Indian Space Research Organization. The joining bonus, for any faculty member joining after 5 September, will be disbursed to the recruits in phases, the details of which have yet to be worked out by the institute.